I'm really loving my new home and soaking up as much attention as possible! Sweet Pea loves me, even though she sometimes acts annoyed, and I'm supposed to go meet the other Monkeys soon! 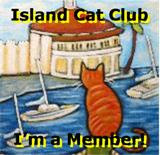 The only reason I haven't gone yet is because of a small problem I'm having - I'm peeing outside of the litter box. The humans brought me to the vet and had my peepee tested, and it turns out I have crystals in my urine. The vet was surprised that I have them at such a young age, but he gave me some medicines and I have to eat wet food (which is GREAT!). The Monkeys' Mommy doesn't want me to pee on her things, so I have to wait until I'm better. I'm really bummed because tomorrow is Samson's birthday and Sweet Pea tells me that they're going to have a BIG party. I guess I'll have to find another way to amuse myself in the meantime. Please drop by Samson's place tomorrow to wish him a happy birthday, and if you don't mind, have some nip and play with some toys for me! Mommy has a day off today and even though she says she's going to be very busy, I am going to claim my place on the sofa. I know her too well, and sometimes when she makes a lot of plans to take care of errands, she ends up being lazy and hogs the whole sofa. I need to spread out and take up as much room as possible. I'm glad I'm planning ahead. This is really comfortable! It's been awhile since we did a Fuzzy Friday post, and with all the heat and haze we have in this part of the world, we thought it was a good time to bring it back. For those of you who are new to Fuzzy Friday, these are photos that didn't quite make the cut for a regular blog post, but Mommy can't discard because we're so cute! Bella - with many eyes! We had scheduled a Thankful Thursday for today but it just didn't seem like the appropriate title when we heard the news that one of our dearest friends, Tristan, had passed away. 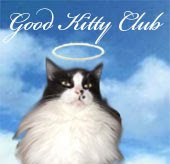 We are very sad about her leaving and we want to send our purrs and thoughts to Angela and Crikey. 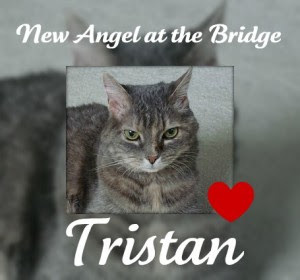 Tristan was a very special girl and a great friend. We will miss her very much. A couple of weeks ago, we were very lucky to win a giveaway on Marg's Animals blog by her friend, Pricilla the Goat, for some fabulous goat-milk soap. We got to choose from a whole lot of different shapes and fragrances of goat milk soap from the Etsy store Happy Goats Soap! Mommy, of course, chose the cat-shaped soap with the 'Monkey Farts' fragrance! She also added to the prize by purchasing an extra bar. This is the description of the fragrance and the soap from Happy Goats Soaps Etsy store...in case you were wondering what a Monkey Fart smells like! This bar is a nice blend of Pricilla and Abigail's milk with shea butter,cocoa butter olive oil,mango butter and apricot kernel oil to make a rich, delightful soap. It is fragranced with Monkey Farts. WHAT?! Well, imagine what a monkey might eat; bananas, pineapple, mango and then he well has some gas. But it's sweet gas. That's what this soap smells like. It's all good. We haven't used the soap, but Mommy says it is really wonderful and she'll definitely purchase again. The soap is very rich and smells fantastic. If she really wants to smell a Monkey fart, I'd be happy to oblige her! Thank you Pricilla for making such rich milk and thank you Marg for having the contest! Samson revealed my new look yesterday, but I thought I'd give you all a more thorough view of my new do. As much as I loved all of my floof, I'm really loving the freedom and airiness of my lion's cut. Check out my cool boots! Thankfully I'm a very petite girl, so this outfit even looks great from behind. I'm sure Deli wouldn't be able to say the same if she had the same haircut! The weather has been nice and warm here so I've been just lying around looking handsome trying to beat the heat. We have air conditioning so it really doesn't ever get too hot. 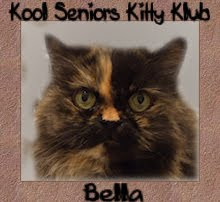 That's why I was shocked to see that Bella took off all her furs! Kittens, hide your eyes - this next photo is rated X! She is strutting around with no furs and she doesn't seem to care what Deli and I think! I know it's rude, but I can't take my eyes off her. 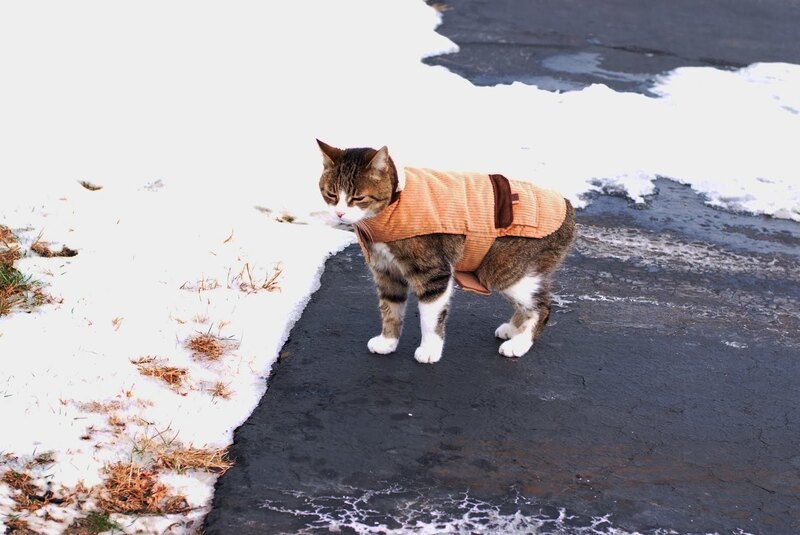 You think you know a cat and suddenly they turn into a nudist! She does look comfy, though. Maybe I should take off all my furs too. I've said it before, but it warrants saying again - Mommy is lazy! Quite awhile ago she told me that I'd have to go in for a spa day to get rid of my knots, but she just loves my beautiful coat and didn't want to have me shaved, so she tried a DIY knot removal. Let me tell you, I'm not happy! My head looks like a mushroom and my fur is all uneven! Aside from the fact that I look silly, the weather has started to get really hot. I put my paw down and demanded she take me to a professional groomer. I have an appointment for Saturday for a lion's cut. Maybe this time she'll learn that if she wants me to have a long, luxurious coat, she needs to take care of brushing me more often! Samson asked me to post today because he's very busy doing 'important Mancat business'. I may not be a Mancat yet, but Mancat business looks pretty boring. I've been busy doing very important Mankitten business, like killing this evil fish skeleton. I need to kill this intruder so that Sweet Pea will start looking at me as fearless, strong and a worthy suitor. She treats me more like a baby than a boyfriend right now. You better run from the big lion, fishy! This is very tiring training! I sure hope Sweet Pea saw how ferocious I was. Maybe I should follow Samson's advice and practice being a Mancat like him. If I keep this up, Sweet Pea won't be able to resist me! We are Catanadians, but we love our friends south of the border and Deli and I wanted to help our new Monkey, Gabriel, celebrate the country where he was born. We are re-posting an older photo of Deli and I showing our respect and love for the U.S. flag. It may seem disrespectful that Delilah is putting the bitey on the flag, but she's a Tortie, and that's how Torties show their love. At least that's what she tells me when she puts the bitey on me! To commemorate the July 4th holiday, Sweet Pea and Gabriel are going to spend the day fighting for freedom. It may look rough, but Sweet Pea is very gentle with Gabriel. We are late posting today because it's Canada Day and Mommy is not very good about posting when she has a day off. Lazy? Yes, she is. 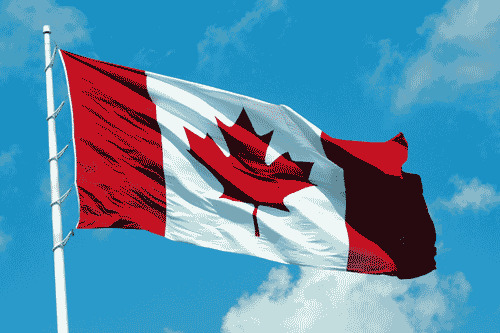 Happy Canada Day to all of our Canadian friends! We also wanted to mention that our friend Scott (who drove Gabriel to us) is sad and missing his sweet cat Max. Max passed away last week at the age of 16 and we are all very sad. We had featured Max on our blog a few months ago and you can read about him HERE. Please join us in sending Scott and his family purrs for sweet Max. Gabriel and Scott bonded during their 3-day travels to Montreal, so Gabriel wanted to send a picture of himself looking cute and happy to Scott to thank him for all of his hard work. This is Gabriel's first official holiday as a Canadian! We will also be celebrating the 4th of July so that he can remember where he came from. 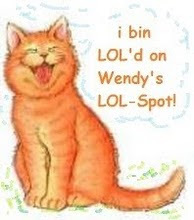 Also, in celebration of Canada Day, the ever so talented Wendy has featured us, along with some other Canadian cat bloggers on her LOL Spot. Have a peek and have some LOLs!